Left to right: Rex Young, Amy Newman, K.T. Vogt, Vilma Silva, Paul Juhn. Photo courtesy Jenny Graham and the Oregon Shakespeare Festival. OSF’s 2017 production of The Merry Wives of Windsor is also an ‘80s jukebox musical. This theme may seem strange to traditionalists, but it invites a sense of campy fun into one of Shakespeare’s lightest, silliest comedies. The antics of classical farce combined with bright colors, excellent comedic acting, and cheesy dance music create a remarkably entertaining show. OSF’s talented ensemble is generally subtle and nuanced, which makes the times they throw caution to the wind and embrace excess all the more fun. (See also their production of The Wiz from last year.) 1980s hits from a variety of genres punctuate key parts of the production: Bardolph (U. Jonathan Toppo) and Pistol’s (Al Espinosa) plot to expose Falstaff is set to Bell Biv DeVoe’s “Poison,” while the fairy dance at the show’s climax starts with “Thriller,” dance included, and ends with Guns N’ Roses. At the core of Merry Wives is the bumbling rogue Falstaff, who also makes an appearance in the Henry IV duology that runs concurrently with this show. Standing in his shoes is K.T. Vogt, a nine-season OSF mainstay best known for her comedic roles. Vogt’s performance is outstanding, operating Falstaff with fifty percent ego, fifty percent animalistic lust, and zero percent self-awareness. This impeccable character work is only matched by Vogt’s gift for physical comedy, jumping and air-guitaring across the stage when she makes her appearances. The rest of the cast keeps up with Falstaff’s buffoonery. Anne Page (Jamie Ann Romero), the ostensible protagonist of the play, resolutely attempts to tie the knot with Fenton (William DeMerritt). As befits the setting of the show, Romero channels the female lead in every John Hughes movie with a sense of earnest, mischievous defiance. Rex Young’s Master Ford, an uptight, jealous stick in the mud, serves as a foil to Falstaff, but has the same over-the-top comedic energy. Jeremy Peter Johnson’s Doctor Caius, though a side character, nearly steals the show with an outrageous French accent and wild swordplay. Ulises Alcala’s costume designs help synthesize the updated theme with the original setting of the play, Elizabethan England. Characters are clothed in gowns and doublets saturated with the bright pastels common in the ‘80s, and other throwbacks to that era – including Anne’s hair – appear on occasion. Codpieces play a major part in both the costuming and the comedy, with Falstaff sporting an oversized model complete with a zipper compartment. In order for Shakespeare’s plays to be relevant to the modern day, they need to be viewed through the lens of goofy camp as much as the lens of serious reenactment. 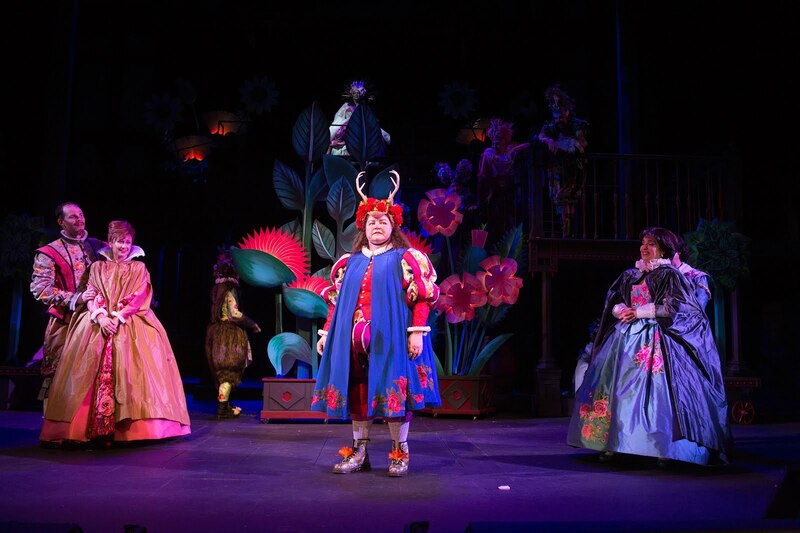 OSF’s 2017 production of Merry Wives is a marvelous execution of the former, making you laugh at the play as much as you think about it. The Merry Wives of Windsor runs until October 13th.